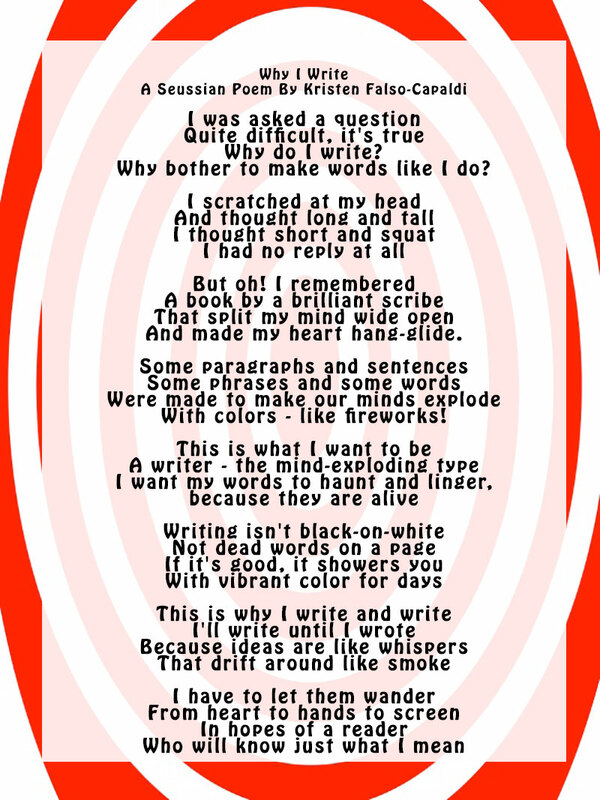 I was tagged by one of my favorite twitter peeps, Siofra Alexander in a blog hop, entitled “Why I write”. Siofra writes a beautiful dream blog, which you can check out here. You can also read her response to the writing question on her blog as well. When I first sat down to write this blog, I found myself hitting road blocks. Why do I write? I write because, simply, I love words. But that’s a bit of a short answer, huh? So in order to truly express my love for words, I tapped into my inner Dr. Seuss. The result was the following poem. Enjoy! Up next on the blog hop is Beth Deitchman. Beth Deitchman is a writer, actress, pilates teacher, publisher and former ballet dancer. She writes brilliantly descriptive flash fiction and short stories in a variety of genres; she is currently at work on several projects, including a magical book series, Margaret Dashwood, an Encyclopedia-Brown style short, a super creepy story called “Irina Voshnikaya,” about a vampire ballerina and she’s begun research for a realistic novel about ballet dancers. Beth is also co-editor of Luminous Creatures Press, which ran a challenging 500-word flash fiction contest over the summer.